I have been a bit obsessed with Halloween as of late. As of today, there’s barely six months to prepare! 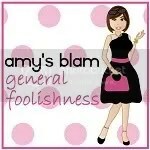 Where has the year gone? 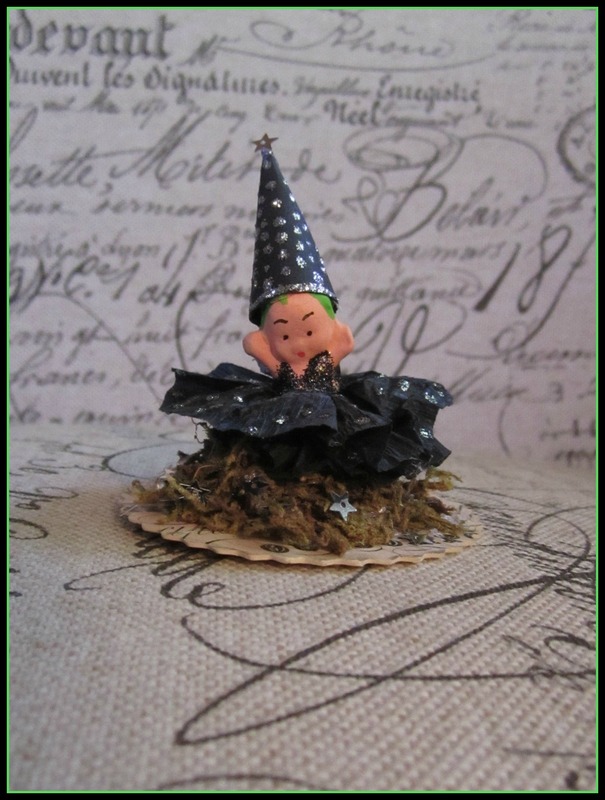 I had another project all planned out in my head for Lisa Kettell Designs when I was rooting through my craft supplies and came across these wonderful witches; the Kewpie Magic Witches from Lisa Kettell Designs. These come in handy because capturing a witch of your very own is tricky, witchy business and even these little ones are full of tricks and treats. I jazzed my witch up using the silver Stickles because witches love sparkles. Honest. I also popped a tiny star on the tip of her pointed hat and made her a “top” with black Stickles. While she dried, I used a paper punch to cut out two circles with pinked edges to use as a base. I cut out a circle from the thin cardboard and glued them together to make a base. I covered the top and bottom of the cardboard with the printed paper–which is important if you plan to use her as an ornament. Then I made a ring of moss around the base, using the bottom of my cloche as a guide since I wanted the majority of it under glass. When the witch was dry, I made a big dollop of hot glue and dipped her feet in it, pressing lightly until she was “set.” Then I glued some tiny stars around the moss because, in my opinion, you can never have too many sparkles. Once everything was dry, I ran a line of hot glue around the bottom of my glass cloche and, carefully but quickly, moved it in to place. Using the glue gun and my small black pompom trim, I made a border around the base of the cloche. 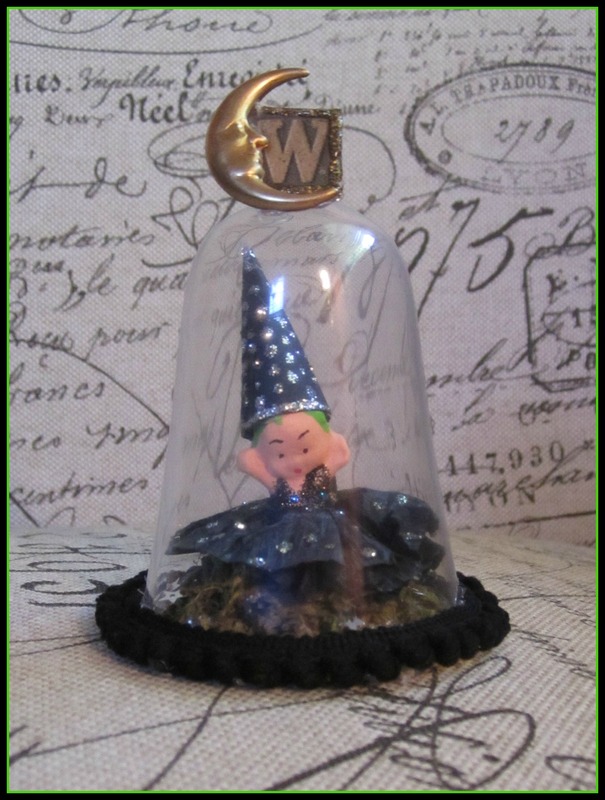 I glued my W, for witch of course, to the top of the cloche using its ring as the base. If you are making an ornament, I would run my ribbon or whatnot through the ring before attaching the letter. Then I simply glued the moon to the letter and with a dab of glue, to the glass. Now my tiny witch is spellbound and ready for happy hauntings and magical mischief!